Game 4 is ready now! Initially, this was going to be an ice cream catching game. 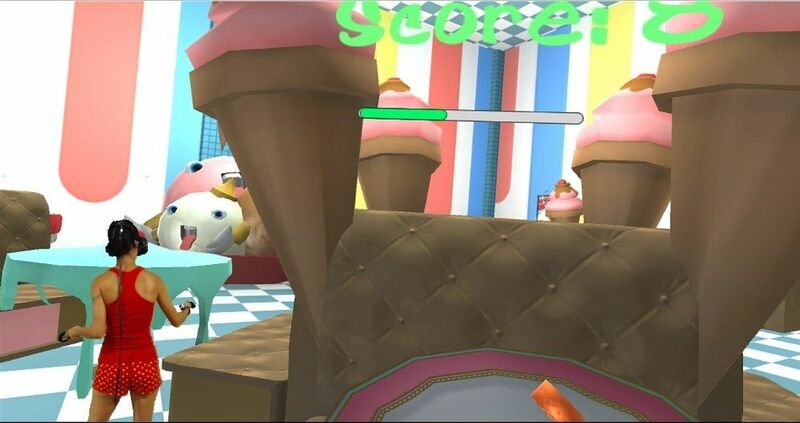 The game play would have been to catch falling scoops of ice cream on a cone and stack them up. Due to a lack of good ice cream art assets, a change had to be made. I toyed around with a few other things, including kittens, but candy turned out to be the most enjoyable. For this game, you have 2 plates. Candy falls from the roof of an ice cream parlor where a miniaturized you stands to catch it and drop it onto a tray. Each piece of candy you save earns a point. Get as many points as you can within 90 seconds and compare with your friends and family. This turned out to be more fun that I’d expected. I thought catching things might be good, but didn’t realize how much balancing things adds to the game until after implementing it. I’d started with a bucket, but it was pretty dull. Going to plates and a tray to drop them on made it far more engaging. My wife and kids all seemed to enjoy it and wanted to compete to catch the most candy. Surprisingly though, my youngest had a really hard time catching them (he typically scores better than the others in most of the games). Overall, I think it was a success and a good little game that shows a fun mechanic. Not much to the implementation here, but I’ll cover it anyway. The mechanics were very simple to add. The hardest part was finding a theme with available art that would work. The candy spawns slightly above the ceiling. There’s a candy spawner that picks a random area within a couple meters each direction. The candy has a high drag value so it falls pretty slow. When it hits the plates, that drag gets reset to 0 so it can roll right off. Each piece also has an audioSource that contains a sound effect for when it hits the plate. The plates are attached to the Vive Controllers. They have a mesh collider and a tag that says they’re plates. The tag is used by candy to know when it should play it’s sound effect. 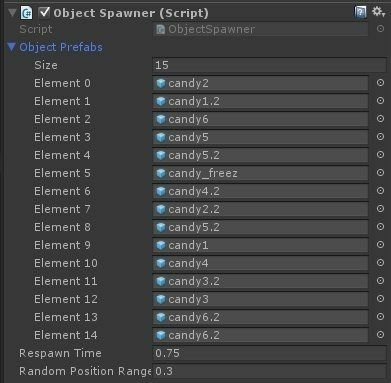 That’s all there is to them..
You may be able to tell from the script, the spawner just has an array of Candy prefabs, a spawn time, and a randomized range. 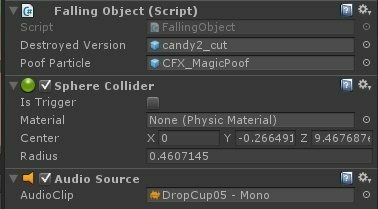 It just runs a countdown timer and spawns a random candy from the list with the x & z position randomized from -0.3 to +0.3.